Why is it that the Greater Metropolitan Arab MalWart store cannot offer for sale english muffins that are low in sodium (~0.2 g or less per muffin) and still taste good enough to want to eat? What they offer here are indeed almost low enough in sodium but have a textture and taste that cannot be made palatable my any amount of toasting, spread, jam, jelly, or syrup. In fact their feel and aroma come very close to evincing a gag reflex. Not that they do a very good job in almost all areas of offering low sodium foodstuffs but in this instance when they almost do, the effort is compromised with nastiness. Or is this part of the strategy? Sunday again. Hard friz last night here in Nawth Alibam. Probably lots of fender benders up in Huntsville, Nawth Alibam’s Shining City on the Hill, and even worse. Excellent conditions for Nawth (?) Alibam bogs to practice their game of ‘driving as fast as they can on slippery roads in the theory that faster means shorter risk time‘. Oh well, we can only hope that they haven’t reproduced yet; that way not only are the genes removed from the pool but they don’t leave destitute orphans. Despite my efforts yesterday, my queue of accumulated RSS feed articles has not diminished. Evidently the winter is a bit of the opposite of August and rather good nerdish stuff accumulates faster over the weekend. Or perhaps it is just a sign of the continued decay of the newspapers and editors are having to publish less celebrity trash and government propaganda and more attention gathering science stuff just from availability and absence of mediasts? Anyway, I note an article [Link] in the Washington Post about research by the National Wildlife Federation that indicates that global climate change is more heat in the environment (atmosphere) which increases the variance of weather conditions, which in turn influenced the severity of this winter. Hence, contrary to what all the bogs have been prattling, especially the corporate and political types, global warming has made for bad winter weather! This is very close to my own estimation of the situation based on back-of-the-envelope calculations but I am not completely convinced given the inherent political nature of the organization. They are, after all, a greedy pseudo-charity and since they can’t argue for rescuing wildlife in Haiti they have to make an argument for rescuing starving wildlife from the disaster of climate change. I should be happy to donate to them if they would go around making the bogs who are loudly declaiming that global warming is a conspiracy proven by the severe winter cease their declamations. To paraphrase Mr. Jefferson, if you wouldn’t burden me with your ignorance of science I won’t trouble you with my greater but incomplete knowledge of it. And that especially goes for the former deputy vice president one administration removed. I find myself a member of the largest group courtesy of the ministrations of a former Yankee army general officer. The only thing nice I can say about Apple is that their systems are an improvement over dumb terminals for ASCII email over a 300 baud telephone line. And while I think an eTablet (ePad?) would be a useful thing I am not going to pay Apple prices and use a tyrannical OS. Also, Clark’s dictum aside I have a fundamental problem with any corporate oligarchy that tells me technological is magical. The burden of proof is on you and distasteful propaganda is inadequate if odious. Next, genetic dating research indicates that homo neandertalensis went extinct 39 KYA. [Link] The question now adds the complication of why neandertals on the iberian peninsula were able to resist sapiens for 5KY after the disappearance of neandertals in the rest of europe? The theory that global warming caused the growth of protective forests makes sense only if neandertals collectively developed a strategy of establishing a buffer zone by pulling back into a defensible homeland? So if they are less hardy than depicted previously could they also be smarter too? Speaking of smarter, it appears that the Yankee congress is natural after all, in fact, they seem to be fractal in nature. [Link] That’s fractal, not fractional or fractured, although those terms do seem to be accurate as well as applicable. At least we have not had to witness any members caning (beating with a walking stick or cane) other members as used to happen. Or is CSPAN censoring the members’ brawls? There is a difference between sandpiles and congress however. Once a representative has signed, he or she cannot do it again and so take no further part in the process. Any further pressure on them is simply dissipated. So representatives cannot topple more than once, unlike sand grains which can keep on toppling as the pile gets bigger. I suspect the difference becomes less if we associate an avalanche in sand with a bill in congress. Or is that association too nekulturny? You’ll have to read the article to get the serious deprecations of our elected thieves legislators. Apparently Nawth Alibam dodged much of winter weather last night. At least we didn’t get to the ice-water phase temperature. A new study suggests laws banning the use of hand-held devices while driving have not reduced the rate of accidents in three states and the District of Columbia. further, the reportage admits to being mystified. Ain’t mystifying at this end. First question I would ask is just how rigorously is the constabulary enforcing the law? If they aren’t then behavior isn’t changing and you can’t expect change in behavior. Gee whiz, go talk to a behavioral psychologist if you don’t think a simple country physicist can’t be accurate. And if they are enforcing enough for people to not hold cellular telephones in hand are they using earpieces and the like? Then, again, the lack of change is not surprising. It isn’t just whether they are hiding the telephone, it’s whether they are telephoning. Studies have shown that it’s the distraction more than the physical holding that matters. [Link] Gad, get your cranium disconnected from your alimentary canal already! And while we’re on alimentary crania, it seems that Apple qualifies. The Register has published an article that there are at least two other products with that name and the one from Fujitsu, a PDA, is registered and all that officialese. [Link] First thought on this is that hopefully we may enjoy a nice strident, brutal litigation that encompasses the apple getting cored. Second thought is that sepukku would really wreck havoc with that transplanted liver. Third thought is that this just might stumble Apple enough that the real computer manufacturers, or, at least, the ones run by accountants, can get product into the market. 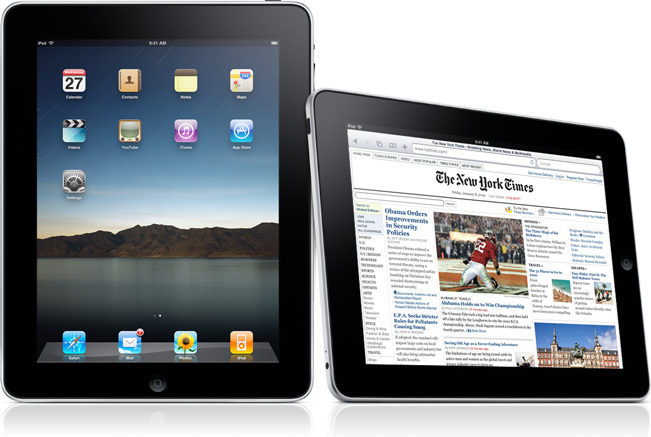 Meanwhile, ARS Technica has an ‘analytical’ piece on the impact of the iPad on the marketplace. [Link] Some of what they have to say is not badly off trajectory, like the price wake-up that seconds netbooks. But they badly miss that Apple prices everything at twice what it should be. Is this an artifact of being urban liberal journalists living in an environment where everything costs twice (minimum) as much, or is it due to the mind clamping effect of using Apple products? The World Wonders! The more accurate take requires a bit of renormalization. The cost of an ePad, especially if it is running a useful OS like a suitably modified Linux variant, say of UBUNTU, should retail for something of order 0.25 K$, not 0.5! IOW, a few dollars less than the cost of a good netbook. So the comparison they draw is accurate just not the pricing. I paid $273 for my HP Itty Bitty Lap Top and once I got UBUNTU to work on it I had a good box albeit a bit slow and myopic. IMHO I find no reason for anyone to pay more than $350 for a netbook unless it really isn’t a netbook. If you are buying a 13 inch display lap box then that isn’t a netbook and you can pay 1.0 K$ for it, especially if all the MegaHard OS sirens and gongs are added in. But a good workable ePad for the hinterland, where 3G is largely a blatant corporate prevarication/propaganda, should retail for less than a netbook since it doesn’t have a mechanical keyboard or hinges or ….. It’s an opto-mechanical brick fer deity’s sake! So get wise to price. And invest in Windex. Maybe they can develop a pocket sized spray that is a combination screen cleaner and face sanitizer? And while we’re on the subject of paying MegaHard TOO MUCH, another article in the Register indicates more of their sabotage. [Link] Many of us remember the catastrophe – blessing in disguise – that was VISTA. The wonders that it did for Linux and Apple were enormous. The last time so many people abandoned their computer serfdom was when IBM introduced the PC and we could get away from Commodore game boxes pretending to do real work. Of course that was the start of the MegaHard enslavement but that seems to be the nature of modern society; if we aren’t owned by agriculturists we’re owned by corporations. One of the big selling points of W7 was that unlike VISTA you didn’t have to go buy all new hardware to run the OS (and what’s the challenge of buying a new box with the OS already installed? No terror at all in that.) And many people who had hunkered down with XP or even experimented with other OS came back and the third world got lots of money for overadministered vaccines. But now the upgrade from Office MMIII to MMX is offering the same negative cash flow. Since most people now define their computational needs by what they do and thereby what clients they use, for MegaHard slaves Office is a more accurate characteristic than is Windows. So the role of MegaHard forcing the purchase of new boxes continues just covertly moved up a notch on the computational Maslow’s hierarchy. Gad, ENOUGH! My mouth feels dirty just mumbling along as I key. I have a hotmail account. There are many things I do not like about hotmail such as its slow performance, probably a consequence of the bandwidth lack here in the hinterland, how it has gotten where it fights you when you want to shut it down, which indicates to me why young bogs keep it open all the time, and how when you do get it to shut down you get routed to the MegaHard news page, which is overladen with intellectual sewage and unwanted demands on bandwidth. Also entirely too much artificial celebrity nonsense. By now it should be evident that I prefer an email client to working in a browser. But I still have to check my browser-mail accounts since I use them so little that I don;t trash up my box with the agony of getting my email client to pander to their client requirements. As a result this morning, as I was closing the web page of MegaHard mind stercus, I noted an article entitled “10 things not to buy in 2010”. [Link] The article purports to describe a list of ten extincting technology dinosaurs and that rather naturally piqued my attention direction. DVDs I still purchase DVDs for the simple reason that, being an Old Retired Flatulence, I tend to watch old movies that are not often offered by the subscription services. This is reinforced by a perception that movies are not near as good today as they used to be. Home telephone service I have a home with a metal roof. Until I install cellular phone repeaters inside my house, cellular coverage is spotty. Hence, I still have land line service. Besides, why should I pay for repeaters? That should be done by the cellular provider; after all, I pay enough for the service. External hard drives This is another matter of an on-line service. Being an ORF, I have delusions of privacy, unlike the GEN Y bogs. More importantly, I distrust that which I cannot control, and these on-line services are resoundingly in that bin. Also, do I really want some corporation having more control of my existence? And external hard drives are cheap to someone who used to pay as much for megabytes and we now pay for gigabytes! Smart-phone also-rans This is one example where I am both perplexed and henpecked, if I may use the term. Until I retired my cellular phone was provided by my employer for security reasons. When I retired FD SCP got me a cellular phone. I still have this phone and it is terrible. Entirely too SMALL! So the issue of smart versus pseudo-smart is totally irrelevant. Compact digital cameras This s more about GEN Y ignorance than anything else. Those of us who grew up with film cameras and made the transition in adulthood to single lens reflex film cameras, went directly to digital SLR when digital cameras came out. I only recently bought one of them dinky eBrownies, as I call them, probably unintelligibly to GEN Y, so I could have something to carry in my pocket all the time. And I forget it a lot. So chalk this one up as the ORFs being ahead of the children. Newspaper subscriptions I still subscribe to The Arab Tribune, and I will till they go all electronic. I gave up on The Huntsville Times when they got where they couldn’t get people to deliver more than 0.5 of instances. So when you expect seven papers a week and get three, that is a sign of incompetence. But yes, newspapers are declining mostly because of age gap. This is shaping up to a major kerfuffle since the news the GEN Y are getting, and myself courtesy of RSS feeds, is paid for by the subscriptions and when they go away? As Robert Heinlein said in The Moon Is A Harsh Mistress, TANSTAAFL. New college textbooks Textbooks have always been the biggest social injustice of our academic environment. The law of supply and demand requires that textbooks be expensive and the more useful they are, the higher their cost. Going used, or even electronic will not change this. The only way it gets changed is if the academic world embraces self-publishing and open source so that the textbook publishers can be rendered extinct. Blame this one on rampant capitalism, not social evolution. Energy-inefficient homes and appliances This is same as above. The difference is that we aren’t going to go around tearing down heat leaky houses to build new ones. It don’t work that way given the financial system we have had since the end of the Middle Ages. Ditto for appliances. So chalk this one down to the journalist who wrote the article ran out of real steam and needed a fog padding, which this is. Well, the Apple apparat has done the gravity thing. They call it an iPad. Look like a miscegeneous cross between an eReader and an iPhune to me. Several questions immediately emerge. If I buy one am I going to be stuck with AT&T’s overpriced contract and almost non-existent network? Why, if I live in the hinterland, do I want to buy one? (People who live in cities will want to just because it’s a fashion statement.) How much am I going to be charged for things I can get now for free, like RSS feeds? And when can I get one with a Linux OS and without the branding? The idea of a miscegenation between a netbook and an eReader make sense but only if it has computing power and adequate resolution. And an absence of slavery to overgreedy corporations. implies to me a major change in how graduate life may have changed since I was a student. When I was a student at the campus of the Boneyard, lunch was almost always a packed lunch, almost always IGA peanut butter on toasted week old bread, the left overs unsold at the used (day old) bread store. Breakfast was cosmetically damaged instant oatmeal, and supper was a cosmetically damaged Banquet television dinner, which was about as close to television as I got in those years. I had no knowledge of instant noodles and to this day I am unsure of whether this was an individual ignorance, a regional eccentricity, or just that such had not been discovered by students in those days. Anyway, the Ramen noodles option was of measure zero. More critically what one had for lunch had more to do with economics than anything else. The only graduate students who regularly ate lunch at a pay place were the guys sent by companies like Hewlett Packard to get graduate degrees. The company paid their salaries, bought their houses, ….. As for me, my TA stipend usually let me eat out one supper or two lunches a month and my choices were between a McDougals at the boundary between town and gown, and the cafeteria in the student union. Aside from the pom frits, the cafeteria was the superior, hands down, and they had a Ruben sandwich that I still dream about. The McDougals was a steady national champion among McDougals restaurants (?) in the frying of pom frits. I generally selected the cafeteria 9:1 over the McDougals. All this changed at the campus of the Tennessee. For one thing, the campus had no cafeteria. In fact they didn’t have a student union until after I graduated. Also, I was working full time for the Yankee army and hence had adequate funds to eat at a pay place. All my classes were either early in the morning, 0500 or so, or after work, 1700 or later, and research was done in and around class and work. Also, I had no student cubby at the campus of the Tennessee; my presence was limited to classroom, weekly seminar, and camping at the mainframe center. This was long before terminals and especially desktops. I also don’t recall effort as being a factor as much as time was. You had to be pretty unbusy to go off to even the cafeteria for lunch. And grossness? Until you’ve lived on cosmetically damaged television dinners for 21 months straight you have no appreciation of contemporary grossness. But it does make me nostalgic for the dorm cafeteria I ate at my freshman and sophomore years of undergraduate shul. Wednesday is “Quirks and Quarks” podcast day at gym, at least for SCP. I have no idea what the other people there listen to – except for a young woman who just started coming this week in the time period I frequent. She listens to some music whose only mentionable feature is that she plays it very loudly. Even wearing ear buds the spill over is loud enough that it can be heard anywhere in the gym. Indeed her volume is so great that it even drowns out the two other young women who talk incessantly and loudly about matters that I would expect they should keep confidential. This is one of the strange things I note at gym. The loudest people are the young, and especially educationists. The latter, in particular, seem incapable of speaking in what I would consider to be an indoor voice. No wonder the kids have to yell if that is how overbearing the teachers are. Anyway, I have have switched to a pair of noise cancellation headphones on my MP3 player and as a result I am not immersed in something that must be music, at least based on its occasional tonality. As a result I was able to listen in relative ease – these headphones are rather heavy – to a podcast from 12 December of last year. [Link] The only part of the podcast that adhered to my consciousness was an interview with a Russian journalist who has written a book about Grigori Perlman. Perlman is the mathematician who seems to have proven Poincaré’s conjecture. He also was awarded the Fields medal and declined to accept, a matter of some grrr brrr in both the maths community and the media. The journalist is noteworthy because she admits that she was unable to write a description of what Perlman had done. Honesty in journalists is a rare commodity and hence refreshing. Her admission also has the salutary effect of damning all of her colleagues who also cannot describe nerd activities accurately but do so anyway. Almost all of the interview was devoted to discussing Perlman’s behavior rather than his accomplishments, very much the type of personality journalism that is so damning of journalism in the main and happily largely absent from this particular program. Ah well, even the best ratio of pony to poo leaves some poo and this most definitely was. Much was made of Perlman’s denial of his award. That this was noteworthy demonstrates that Q&Q is a journalist thing even if it is about nerd matters. Nerds understand that prizes and awards are largely matters of politics and power, not accomplishment or work. Even the ultimately prestigious Nobel awards are about who holds sway on the selection body rather that the work recognized. In fact, the only intriguing thing associated with this is how the bogs – and some geeks – fail to understand this. Evidently one of the major differences between homo sapiens nerdensis and homo sapiens bogensis is that the latter are fundamentally unable to comprehend, perceive even, what the former do. They certainly do not understand that the truly best of nerds are not the ones with prizes. Indeed in many senses those prizes serve as red herrings. But the entertaining thing that they hashed over in this interview was the Asperger’s thing. What was original, and hence intriguing, was the suggestion that because nerds value the singularity of focus typified by Asperger’s, there is a cult of Asperger’s envy among nerds. Of course, being journalists nothing but unscientific and untested observation was offered up with this proposal. Hence the intriguing question of whether nerds have an ‘Asperger’s culture’? That is, a set of survival rules based on emulating Asperger’s ? I really must consult with my anthropologist colleagues.